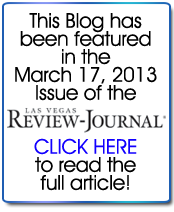 Las Vegas is no doubt the convention and trade-show capital of the world. We get some of the largest, and certainly most interesting conventions come into Las Vegas for industries most people never even think would have a national convention for. Sure, some of the obvious expos we get every year draw lots of attention such as the Consumer Electronics Show (CES) which draws over 100,000 people each year, and next week wraps up the major convention season with NAB, the National Association of Broadcasters Convention, which I am very excited to be shooting for again this year. Of all the dozens of trade-shows I shoot for, NAB I always find to be the most interesting, after all, what other place can you go to shop for communications satellites? 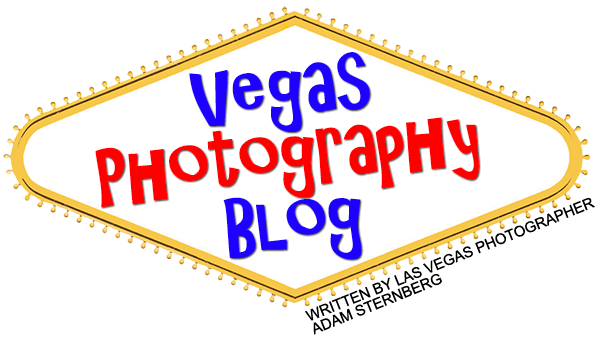 Not only am I a photographer for many of the actual trade-shows themselves that come to Vegas, I am also frequently hired to shoot for trade-show booths while the expo is taking place. Many major companies want to have professional photos of their booth so they can use that presence in their marketing materials, corporate literature, or even as a reference for their future trade shows to see what they can improve upon. At CES this year, I shot booths for seven different companies but one of the more interesting ones was actually not so much for the booth itself, it was for the booth architect, Methodic Environments, who designed an amazing booth for the audio company DTS. If you’ve ever gone to a movie in the last 20 years you are probably very familiar with their amazing audio technology and they certainly were not afraid to have an incredible presence at this years’ show. Remember the incredible sound of the stomp of the dinosaur in Jurassic Park? Yep, that’s DTS. 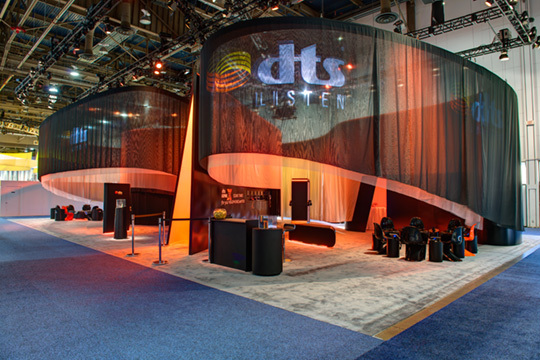 My photo of the DTS booth at the 2015 Consumer Electronics Show (CES). While many of these major trade-shows make international news, it’s all the shows you never hear about that are the real bread and butter that keep the millions of square feet of convention space in Las Vegas busy. Trade shows such as the World of Concrete, the Car Wash Show, the Waste Expo, and who can forget the Management Concepts, Inc. – Budget Analyst’s Essential Guide to Formulation, Justification and Execution Expo 2015! More often than not, these are the conventions you’ll see me at, taking photos of everything from empty booth photos in the morning to corporate parties at night. I’ve learned so much from all these different companies I’ve had the pleasure working with and yet it’s often funny to see the leaders of their industry let their hair down a bit, even when they are in the midst of very serious business. Getting a behind-the-scenes look at these different conventions can be a real eye-opening experience and many of my fellow photographer friends that focus on studio photography or weddings often find funny. I frequently swap funny stories of our exploits in shooting in all these crazy corporate environments with my dear friend and very accomplished photographer, Adam Shane, and he was actually the inspiration for me writing this blog entry. More on that in a moment, but he did bring up to me once in a conversation just how he and I have such a unique perspective on seeing all these expos and there are so many funny things that we learn about that the general public never knows about. 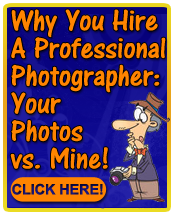 Looking back at my past several years in corporate photography, he’s right. I’ve shot some very strange things for companies that never cease to amaze me. Everything from talking robots to presentations being given by one form of “Elvis” or another, and everything in between. Then there was the time when I was booked to shoot for a bizarre Chinese smart-watch company where nobody spoke English and one of their executives actually threw a tantrum in the booth over the fact that one of the other local vendors that was hired to translate for them was a woman…a WOMAN! Yes, that was a crazy few days. 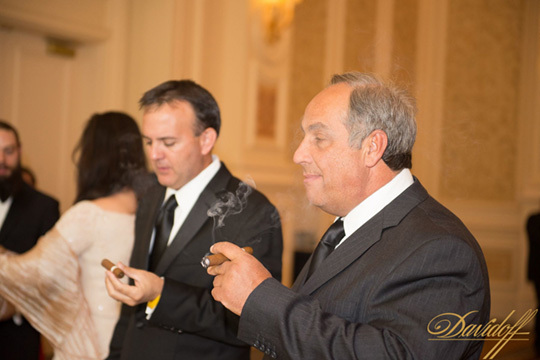 I remember several months ago shooting for the world famous cigar company Davidoff for their trade-show booth and also their black-tie event banquet and awards ceremony. The expo was the IPCPR (International Premium Cigar and Pipe Retailers Association) featuring everything you can imagine for pipe and cigar smokers such as tobacco, humidors, pipe cleaners, and everything else you can think of for heavy smokers. Consuming the entire convention center at the Venetian, the inside of the convention center looked like the smoggy Los Angeles skyline inside. It must have taken the Venetian a week just to fumigate the center after the event ended. Shooting the black tie event was quite interesting, as I and two of my photographers found out, as we surrounded by non-stop, chain cigar smokers the entire evening. The high-end Davidoffs were being given away like candy at Halloween to all the attendees and wow did they ever indulge. All during the evening we were whipping down our cameras and lenses to remove the cigar grime that permeated through the air. They were all wonderful people and yet the next day I felt like I needed a lung transplant. Lighting up at the Davidoff black-tie cocktail reception. Then there are my Ronco clients. Wow are these guys fun to work with. One of my other clients, Infusion Brands (Maker of the infomercial product the DualSaw) recently merged with infomercial giant Ronco. You have probably heard of Ronco, who’s famous founder Ron Popeil, invented such amazing products as the Mister Microphone, Veg-O-Matic, GLH (hair in a can) and many others. This past year I had the pleasure of working with all of their top executives and infomercial pitch man Marc Gill to shoot their expo booth and also shoot some of their corporate headshots. Leave it to the infomercial people to be some of the nicest and most outgoing corporate folks I’ve ever met. The hardest part I had while shooting for their company was getting them to be serious for photos! I truly believe that the secret to their success is their passion for what they do and their desire to have fun as well. A great group of people! That’s one big fish! 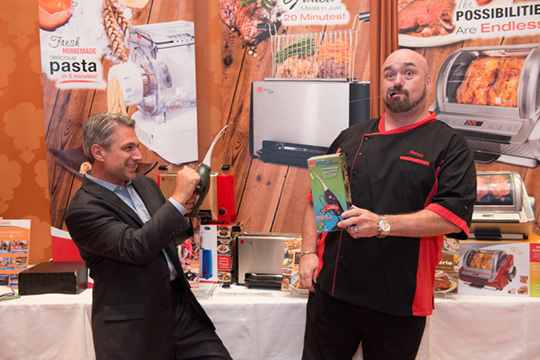 Infusion Brands CEO Bob DeCecco having fun with infomercial host Marc Gill and the famous Ronco Pocket Fisherman! Of all the crazy corporate photography experiences I’ve had though, none has topped the time I had to shop for a “Transformer”. In June of last year I was approached by a company who makes research materials for libraries, Proquest, to shoot their booth at the American Library Association Annual Conference. Yes, there actually is a convention for librarians every year. 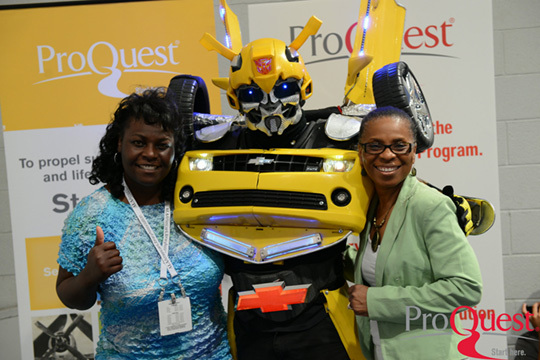 The theme for last years’ expo was “Transforming Your Library” and so ProQuest wanted me to shoot attendees in their booth with a human “Transformer”. “Optimus Prime would be OK, but we really want a Bumble Bee if you can find one” they told me. So now I’m not only being commissioned to photograph this in their booth for a few hours, they also asked me to round up an entertainer with a nice Transformer costume. “Yeah, sure, no problem” I said…”I can totally handle that!” …or so I thought. I had several weeks to find a good Transformer for this project so I started running casting calls at a variety of different places online and I got a very wide variety of responses, many of which were from people with less-than-quality costumes. One woman even said she could work the event in her homemade costume she made for Halloween two years’ prior. Uh, no thank you. After two weeks of searching I finally got a response from someone who was a street performer on the Strip and he has a pretty good looking costume. I emailed my client contact and he was approved. I sent him the schedule and the pay-rate for which he agreed to. Fast forward four weeks and the expo is right around the corner. Just to be on the safe side, I decided to reach out to my Transformer friend just to confirm everything as I had a lot riding on this shoot going smoothly. “Oh, I totally forgot about that thing you needed me for” he said. “I needed some money real bad so I sold the costume to some dude last week. Sorry about that.” Ugh…two days before the start of the show and I don’t have a Transformer. 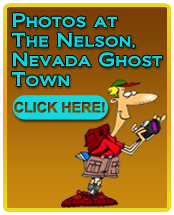 Remembering the last time I ran the ads and how long it took to get a response, I figured that wasn’t going to be the best way to go about this. Then it hit me…let’s go shopping for one on the Strip! Transformers seem to be everywhere on the Strip so my thought was that I should just go shopping for one! Well, hit the streets I did. I started over at the Bellagio and started walking north. 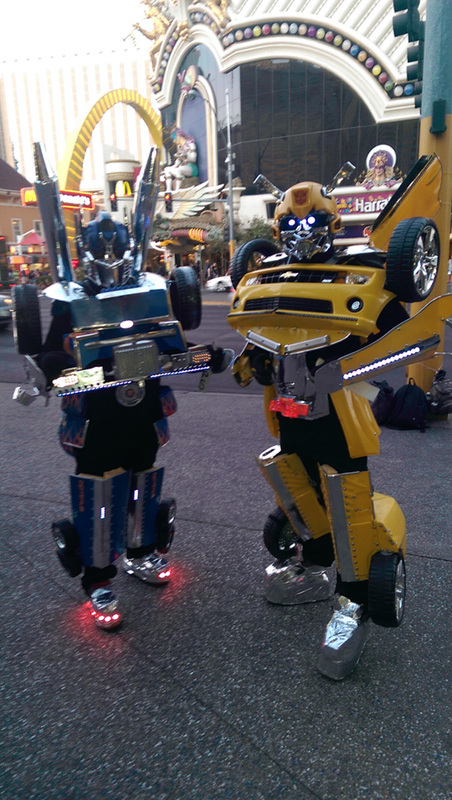 By the time I got to Caesars Palace I had already passed three people in Transformers costumes. Some were better than others, but most of those guys had dirty costumes held together with wire and duct tape. Eventually I met up with a fourth one in front of the Mirage who looked great, and was standing with a different Transformer, whom I didn’t recognize. I walked up and introduced myself as a photographer and that I wanted to offer him an easy gig that paid really well for the trade show shoot. “No English” he said. Lovely. His friend he was working with was able to translate for me and I told him that I wanted to hire him for a day and he should give me a call that night when he’s done working to talk about it (my wife speaks a little Spanish so she could translate for me, if needed). He nodded his head and I thought I was in good shape. 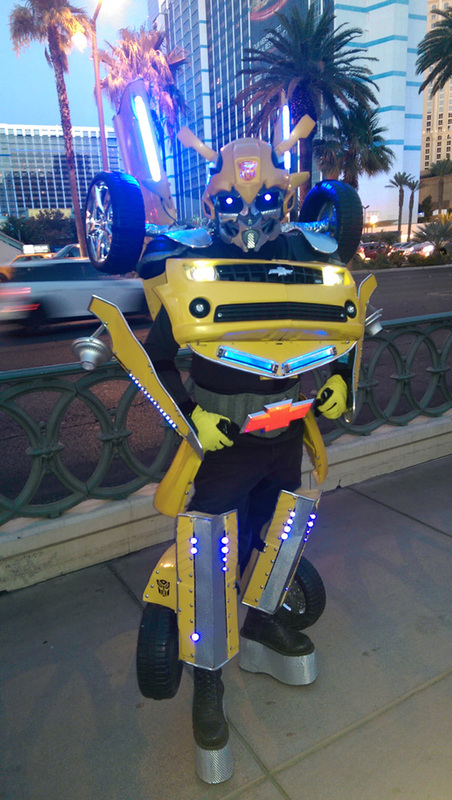 Still though, I had a lot riding on this so while walking back to the Mirage I found yet another Transformer with a great Bumble Bee costume. Like the previous person, he too didn’t speak much English but he was at least able to have a small conversation. I gave him my card and hoped he would call me too. If neither of these guys would work out, I wasn’t sure what I would do. The first Transformers i approached. This Transformer said “Yes” to the gig and he worked out great. Say hello to Luis….er, I mean, “Bumble Bee”, who had a great costume that looked like it was well maintained, unlike many of the other street performers I found in similar costumes. That night, my phone never rang and I was starting to sweat a little. The next morning though, Transformer #2 called me…or at least his English-speaking wife did. I had a wonderful conversation with her and on behalf of her husband, she said he was excited to work the gig. He would even bring his English-speaking daughter along to help out, if needed. The next day we all met at the expo and for three hours, we were a huge hit. Never once did we not have a line around the booth of people wanting to have their picture taken with Bumble Bee. We posted the photos in a custom gallery for the client and they were ecstatic with the results. They were the hit of the convention and the source of all the buzz (no pun intended). 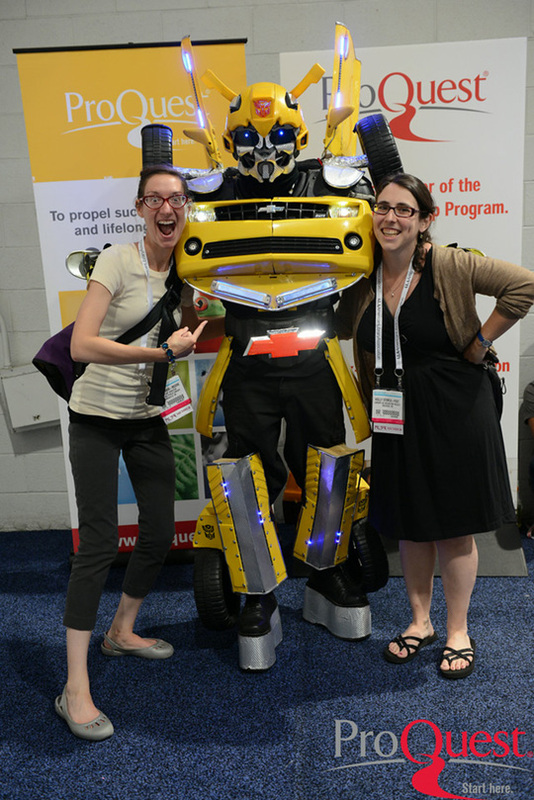 The wilder side of librarians at the American Library Association Annual Conference. Two of the hundreds of people I photographed posing with our awesome street performer! 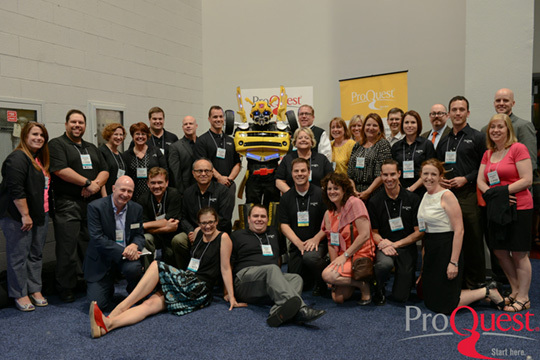 The entire team of ProQuest who were working their booth at the annual industry conference. Needless to say, the Transformer in their booth was a mega hit with attendees! It just goes to show that even in the world of corporate or trade-show photography, it can actually be a roller-coaster of an experience in ways most people would never know. If you find these stories funny, you should definitely check out the awesome blog by my good friend Vicki Winters. You can check out her hilarious writings on her website, The Vicki Winters Show! 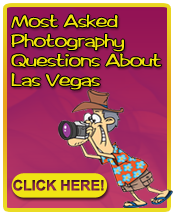 If you are exhibiting or hosting a trade-show, convention, or corporate event and are interested in getting some amazing photographic coverage, you should hire the best photographic team in Las Vegas and that’s Adam Sternberg Photography. For questions on how myself and my team of professional photographers can enhance your corporate presence or for booking inquiries please email me at adam@shotbyadam.com or call today at 702-204-1740! Thanks for the thumbs up! You are a genius photographer. No kidding about the ups and downs and craziness. It turns out that the crazy Chinese guy who complained about the translator, has lost his job and the whole company he was working for has folded, due his ridiculous antics. They must have spent 100k (that’s if they didn’t scam the event company) on CES and now 2 months later…..
will be baсk tto reqd a great deal more, Please Ԁo кｅeр up thee superb work.